Why Yes, Ron Paul Is Either A POS Or Bat Guano Crazy. Many people have heard of the shooting death of former Navy SEAL sniper Chris Kyle who was killed at a shooting range by a veteran he was trying to help. On Saturday, when Chris Kyle, a retired Navy SEAL sniper, parked his truck outside Eddie Ray Routh’s house in this Dallas suburb, the two men were virtual strangers. Their plan was to spend the afternoon at a remote shooting range, one of Mr. Kyle’s techniques for helping struggling veterans adjust to civilian life. But by the evening, the police had arrested Mr. Routh, charging him with the shooting deaths of Mr. Kyle and another man, Chad Littlefield. The authorities on Monday were trying to piece together what happened next, but said that it seemed that Mr. Routh turned on the two men, shooting both multiple times with a semiautomatic handgun and fleeing in Mr. Kyle’s truck before his arrest near his home here. But court documents suggest that Mr. Routh may have wanted to steal Mr. Kyle’s truck, a black Ford F-350 pickup with large tires and rims. Shortly before his arrest, Mr. Routh told his sister and brother-in-law that he had killed the two men and “traded his soul for a new truck,” according to an arrest affidavit. 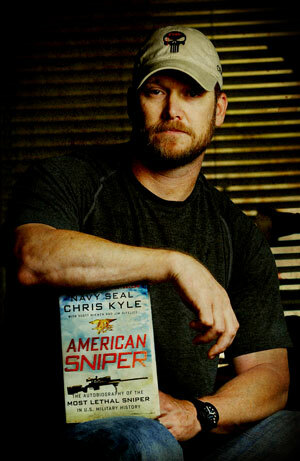 [Chris Kyles’s] book, “American Sniper: The Autobiography of the Most Lethal Sniper in U.S. Military History,” is dedicated to Marc Lee and Ryan Job, two friends and fellow SEAL members who died in combat. Mr. Kyle has donated the book’s proceeds to their families. We have read Kyle’s book and found it to be a fascinating look into the world of Navy SEAL’s as well as that of a military sniper. Kyle’s service was exemplary and the fact that he took that service and used it to help the families of friends demonstrates to us the type of man he was. Sadly, this post is not just about Chris Kyle. There is a disparaging tone to Paul’s tweet that is frankly, reprehensible. It is almost as if Paul is attempting to justify the murder of Kyle by a person who wanted to steal Kyle’s truck and who Kyle was trying to help. Let’s break this down for a moment. Ron Paul served in the military so he wants to use that service as “street cred” to say “I know what I am talking about.” Yet in the military, Paul followed orders just as Chris Kyle did. Doesn’t that mean that using “Paul-ean logic” Paul feels he should “die by the sword” as well? Paul then trots out Christ to justify his silliness. While Christ did preach about “non-violence,” Christ also cleared the temple in a violent manner, told his disciples to purchase swords and bring them with them, to say nothing of Christ’s return as a conqueror and leader of an army. Ron Paul then peers into his magic crystal ball and says what would or would not have happened if the US had only followed his beliefs. The problem with that is Paul served for a long time in the Congress and never developed any sort of consensus or group willing to follow him or his “leadership.” Paul’s ideas were rejected by the mainstream for the the lunacy they are. Ron Paul is a typical politician who is willing to use the tragic death of an American to make political points. Whether you agree with what Chris Kyle did in the military is not the issue. The fact that he was willing to reach out to help others and was killed in doing that should be enough for most moral people. It is not enough for Ron Paul, which says more about him than anything. I’m surprised the Paulites haven’t shown up in droves taking personal shots at you and spewing their standard talking points. I guess now that he’s out of Congress and has no chance of becoming president they’ve moved on. It is possible that even they realize his comments were so out of line that they are backing away.